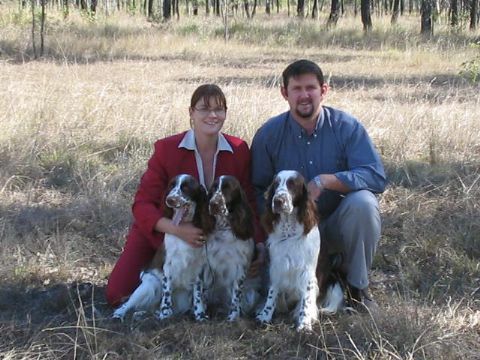 Ndolge Gundogs is located in the heart of the Darling Downs in Queensland (which is approximatley two hours west of Brisbane). We breed, show and love English Springer Spaniels. During the years we have been privledged to own, breed and show a number of Gundog breeds including English Springer Spaniels, Labradors, Cocker Spaniels, Curly Coated Retrievers, English Setters, Irish Setters, Gordon Setters, Large Munsterlanders and Pointers. We have been in the showing arena for over 35 years and have been breeding for over 20 years. Over the years we have bred Multi Best in Show, Multi Specialty Best in Show, Royal Best of Breed and Multi Best in Group winners. Tracey is also an English Springer Spaniel Championship and Junior Handler judge. We invite you to visit our dogs and family on this website and contact us if you would like any information on our beloved breeds.